The original plan was to fly to HongKong and spend the night at the HongKong airport until the morning of 24th Jan. Somehow fate wasn't that keen to grant me my wish. 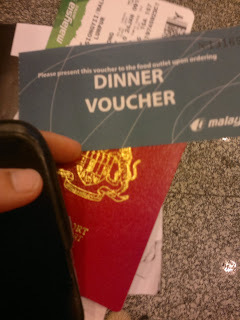 I couldn't check-in due to some problem at the airport and MAS presented me with a free hotel room and a dinner coupon. From sleeping at airport to sleeping in a 5-star hotel. What a twist of fate. By the way the hotel is called Sama-Sama Hotel, formerly known as Pan Pacific Hotel. In addition to the dinner coupon provided by MAS, I was allowed to have buffet dinner at the hotel too. So after I had my dinner at the Secret Recipe outlet at KLIA, I took in as much protein as possible at the hotel for the sole purpose of feeding my hungry muscles. 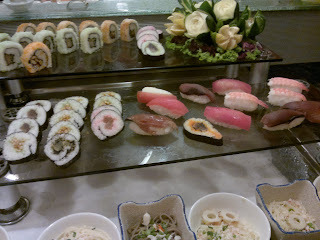 Oh by the way there were sushi-s in the buffet too. But those are all tunas (endangered species) so I took only the vegetable sushi :-( somehow there were scallops, RAW scallops, so I tried one and almost puked all that I've eaten that night. Not a bad experience though. The hotel gave a morning call the next morning. After I had the breakfast at the hotel they sent me to the boarding site with the buggy. The rest was standard operating procedure. This two lions are situated in front of the HSBC headquarter in HongKong. The roaring lion, on the left, is called Stephen. The other one is named Stitt. Both are named after two former branch managers in Shanghai. Stephen has a bullet scar on its left hind leg from the Battle of HongKong. Ocean Park. A must-visit place. They even have a Chinese Sturgeon tank! There are four specimen in there but I was the only one visiting the sturgeons when I arrived. It's sad to say that most people go to the park to see dolphins and seals and other animals and neglect the one animal that genuinely needs their attention. This prehistoric-looking fish has been around since the age of the dinosaurs. But now they are critically endangered due to overfishing and pollution. The HongKong government has at least done something by setting up a tank in the Ocean Park. But I guess it's the people that matter-though I don't think they even care. King Penguins! Oh my god this is the second largest species of penguin in the world. I got so excited I went into the freezing room without putting on extra clothes. Awesome me. Visited the Peak, and subsequently Madame Tussaud Wax Museum. This is what I did to Jet Li. Dr. Sun Yat Seng and his two daughters. This bowl of noodles cost me HK$80 at Lan Kwai Fong. But it's worth it. This statue of Mother Mary is kinda creepy. The hair I mean. The remnants of St. Paul's Cathedral in Macau. During my visit to the bird garden in HongKong, I was sad to see so many endangered species there. The blue Macaws of South America, Cockatoos, Lovebirds, and so many others. Birdkeeping is a chinese tradition but I believe PETA, like me, won't be happy with the bird garden neither. During my visit to Macau's Venetian, they were having this Titanic and Human Body exhibition. This is a real, 12-weeks-old foetus. Wong Tai Sin Temple. They have few others temples lining by the side. Visited the HongKong Cultural Musem. This is actually a stove from the Eastern Han Dynasty. That's more than 1700 years old. Ladies' Market at Mong Kok. Horrible crowd. Mah man, you're too old for this. Sammy Hong. Avenue of Stars. Compared to Malaysia, HongKong has a much more efficient public transport system. The MTR has a length like our KTM, but arrives every two to four minutes. The bus is surprisingly punctual. But the cost of living in HongKong is awfully high. The cheapest meal I had had in HongKong cost me HK$30. That was only a Char Siew Fan. Other than that, I would recommend all of you to visit HongKong. But not for honeymoon. I bet you won't be able to stop staring at those office ladies even with your wife beside you. :) Is in my list.